Ombre Vs Balagae… What’s the difference? Want to add a touch lightness to your hair without the frequent upkeep? An ombre or a balayage may be the perfect solution to achieve the look you’re searching for. Both of these styles give you a beautiful highlighted look without the hassle of touching up your roots on a regular basis. A common question asked about these popular looks is “What’s the difference between the two?”. Although they are quite similar, there are a few distinct differences that will help you better determine which look is more YOU. Your typical ombre will start dark at the root and blend into a lighter shade as it reaches the ends of your hair. Lightener or color will be hand-painted onto your hair in a way that keeps your roots darker than your ends but makes the transition between the colors very gradual and natural looking. This look doesn’t necessarily need to be a dramatic transition between brunette and blonde. Some guests prefer something a little more subtle. 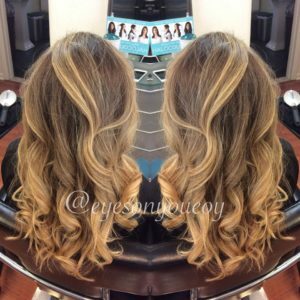 A balayage is very similar in the way that this look is achieved. Just like an ombre, the lightener or color will be hand-painted onto the hair in a way that is very natural looking. Except rather than having your hair transition from dark to all blonde ends, there will be darker pieces left on the bottom to create more dimension. This technique gives you a more highlighted, sun-kissed look. With both Ombre and Balayage your look lasts as long as you want. All you will need is a few touch ups as your hair grows. These techniques can work on any hair color, length, and texture insuring that all eyes are on you!